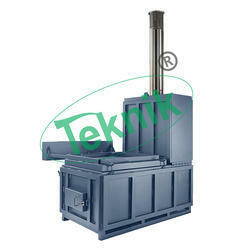 Animal Waste Incinerators offered by us are designed with solid refractory. 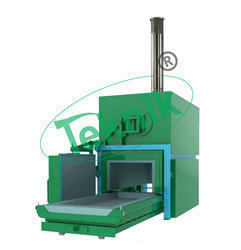 These incinerators are specifically designed to dispose animal carcass. Our animal incinerators are manufactured using quality material, and are reckoned for robust construction and long & reliable functional life. Large Animal waste incinerators incinerate big dead animals like cow, pigs, buffalos, oxe etc.It is widely used to destroy to animal infection diseases, viruses and animal waste material.These products are manufactured using latest technology machinery.Large Animal Incinerator is double wall construction, duly insulated with high efficiency ceramic bricks, with dual chambers for complete combustible their dead bodies/carcass.The heating elements of these systems are made using nichrome wire. The chamber temperature is controlled by a PLC digital temperature controller.These products have separate doors for waste burning chamber and for ash collecting tray.A chimney is provided for emission of fumes. 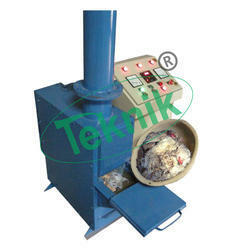 The incinerator reduces most combustible solidwaste to nearly 2-3 percent by volume and upto 5% by weight.Large animal incinerator are easy to install and extremely durable equipment. It is available invaried capacity/sizes based on the requirement of Forest Department, Animal Industries andPoultry farms. Small Animal waste incinerators can be used to dead animals like dog, goat, hen, cat, duck etc.It is commonly used in animal hospitals, clinics, animal shelters, animal control area etc.It is widely used to destroy to animal infection diseases, viruses and animal waste material.These products are manufactured using latest technology machinery.Dead animal incinerator with dual chambers for complete combustible their dead bodies /carcass.The heating elements of these systems are made using nichrome wire. The chambertemperature is controlled by a digital temperature controller.These products have separate doors for waste burning chamber and for ash collecting tray.A chimney is provided for emission of fumes.The incinerator reduces most combustible solid waste to nearly 2-3 percent by volume and 5 %by weight. Small animal incinerator are easy to install and extremely durable equipment. It is available invaried capacity/sizes based on the requirement of Forest Department, Animal Industries andPoultry farms. Poultry incinerators can be used to dead birds like hen, unfertilized eggs, bird dropping, eggshells etc. It is commonly used in poultry farm, breeding, research centers etc.It is widely used to destroy to birds (bird-flue) infection diseases, viruses and birds/egg wastematerial, which will ensure zero infection and safety of birds from contracting any disease.These products are manufactured using latest technology machinery.The heating elements of these systems are made using nichrome wire.The chamber temperature is controlled by a digital temperature controller.These products have separate doors for waste burning chamber and for ash collecting tray.A chimney is provided for emission of fumes. The incierator reduces most combustible solidwaste to nearly 2-3 percent by volume and upto 5% by weight.Poultry incinerator are easy to install and extremely durable equipment. It is available in variedcapacity/sizes based on the requirement of Poultry farms. Power Requirement: Fully Automatic and electrically operated. Loading Capacity: 5, 10, 20, 25, 50 Kg..
Can be made for oil, gas or electricity fueled. Looking for Animal Incinerators ?